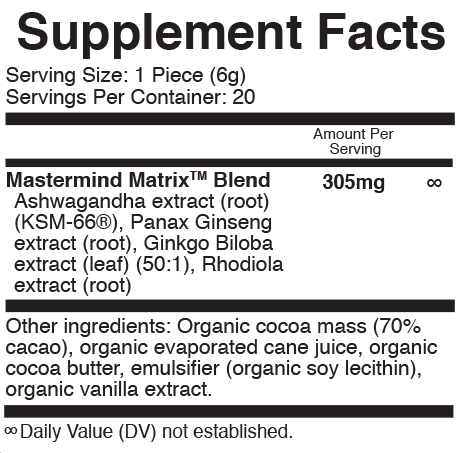 World's first functional chocolate infused with the Mastermind Matrix™ Blend. 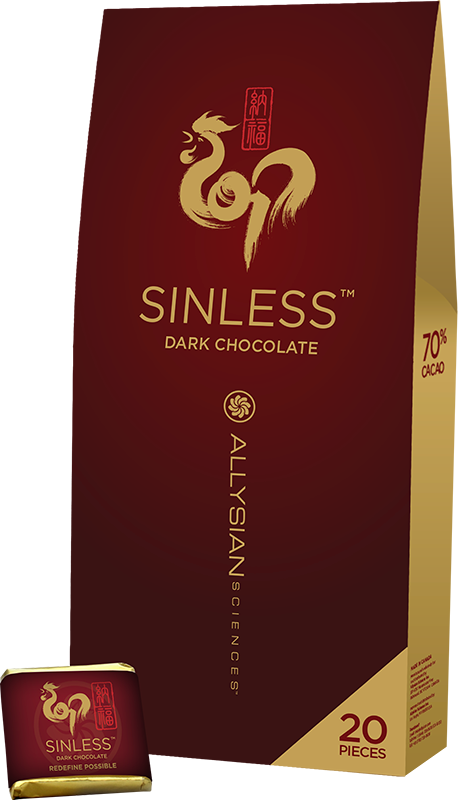 Master chocolatiers and Allysian's scientific advisory board have created the most unique chocolate in the world – Sinless™ Functional Dark Chocolate. More than just chocolate, Sinless™ is a functional food* that is formulated with the finest 100% organic cacao beans selected specifically for their exceptional flavor profile and more importantly their high flavanol, antioxidant, and polyphenol content. The cacao we use is one of the most phytochemically diverse superfoods perfect for a healthy snack. Studies supporting a clinically validated ingredient dose in the Mastermind Matrix™, have been shown to reduce stress by 32.7%*, reduce cortisol levels by 22.2%*, improve mood by 19.18%* and support overall cognitive health while aiding in fitness performance and weight loss. This is incredible and completely new when it comes to functional chocolate! Choudhary, D., Bhattacharyya, S., & Joshi, K. (2016). Body Weight Management in Adults Under Chronic Stress Through Treatment With Ashwagandha Root Extract: A Double-Blind, Randomized, Placebo-Controlled Trial. Journal of Evidence-Based Complementary & Alternative Medicine. doi:10.1177/2156587216641830. Go to Publications of KSM-66™ Ahswagandha page for details. KSM-66® Ashwagandha is the highest active compound concentration ashwagandha root extract available on the market, that was created using a proprietary process that took 14 years of research and development to develop and refine49. KSM-66® Ashwagandha is a clinically proven and award winning ingredient and known as the world’s best ashwagandha gone through 14 certifications. Nootropic Potential of Ashwagandha leaves: Beyond traditional root extracts. Efficacy of Ashwagandha (Withania somnifera [L.] Dunal] in improving cardiorespiratory endurance in healthy athletic adults. Darbinyan, V., Kteyan, A., Panossian, A., Gabrielian, E., Wikman, G., & Wagner, H. (2000). Rhodiola rosea in stress induced fatigue - a double blind cross-over study of a standardized extract SHR-5 with a repeated low-dose regimen on the mental performance of healthy physicians during night duty. Phytomedicine, 7(5), 365-371. Pase, M.P., Scholey, A.B., Pipingas, A., Kras, M., Nolidin, K., Gibbs, A., et al. (2013). Cocoa polyphenols enhance positive mood states but not cognitive performance: a randomized, placebo-controlled trial. Journal of Psychopharmacology, 27(5), 451-458. Enjoy up to 3 pieces per day. "For us, Sinless isn't just a product, but rather a journey from bean to bar. We are dedicated to innovation, and this is reflected through the blend of health, safety, incredible efficacy and quality found in Sinless dark chocolate."